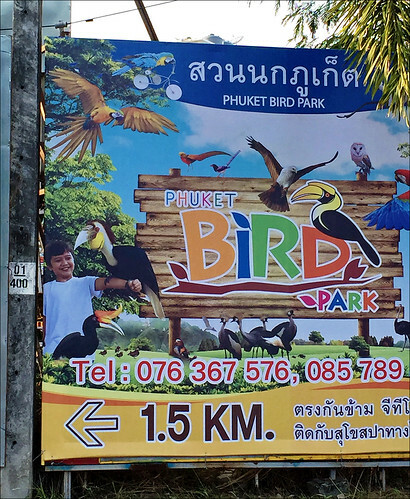 The Phuket Bird Park is a relatively new attraction, just opened in 2013 like the nearby Phuket Botanic Garden which has the same owner. We visited the botanic garden recently, and my family had already seen the bird park (they went when I was working, how dare they!) - their feedback was positive, and I had been pushing them to visit again for a few weeks, but it's hard to find time, as the kids do extra classes at the weekend and music and recently they have become big fans of the Phuket Wake Park. 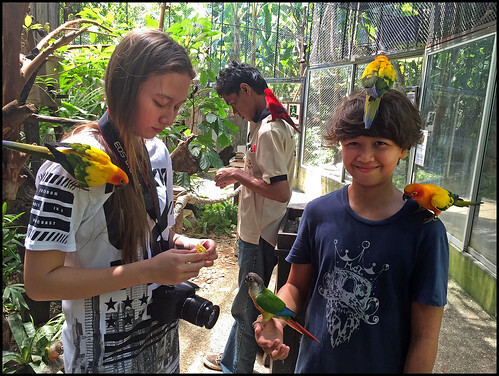 So last Saturday we decided to go to the Phuket Bird Park in the morning before music class. The bird park, aside from lots of birds to look at, has a "bird show" 3 times per day at 10:30am, 1:30pm and 3:30pm, so we aimed for the 10:30am show. I find with many tourist attractions, if you go early in the day, or late in the day then things are much quieter. And it's low season anyway, plus the bird park is new, so I think a lot of people don't know about it. 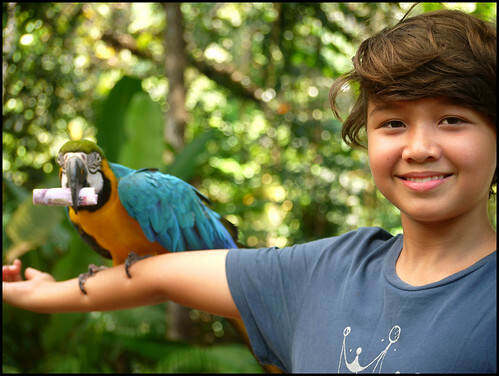 We got our tickets (entry is 500 Baht for adults and 300 for kids - that's the tourist price, we pay a helluva lot less as locals), and went direct to the bird show which was almost ready to begin with just a handful of visitors. (above) An impressive location for the bird show and space for a couple of hundred people, but for this show, by the time it started, there were about 25 people. And almost all were Thai. I'm guessing the later shows would be much busier. The "bird show" started with some parrots who raced bikes ... the parrots later also did some maths, showed their environmental awareness by putting beer cans in the garbage and guessed the age of a volunteer from the audience. Actually I think they were macaws, not that I am an ornithologist! The tiny crowd made it easy for our son to volunteer in the show. Who wants to hold this enormous bird? I believe that's a Wreathed Hornbill. Well, that's what Google told me. And the boy was not finished yet. Who wants an eagle to swoop down and take a hat off their head? The fearless boy says yes again. Good show! Well, the show was extra nice with one of our kids jumping up on stage, a good reason to go early with less crowds. So, with the show lasting about 25 minutes, we then set off to explore the rest of the bird park. We had to rush a bit, as the kid's music class starts at midday. Might have to revisit the bird park sometime soon. After the show we exited the arena from the top. The bird park is built at the bottom of a hill, so there are some ups and downs... and it was a hot day. Fortunately there are also a couple of cafes on the way round, and like the botanic garden, they don't charge too much (20 Baht for soft drinks for example). There are plenty of bird cages next to a wide walkway, lots to see actually. I was kind of expecting just the show and a few cages of parrots! (above) Some parroty kind of birds. (above) Another kind of hornbill. (above) De Niro Parrot. Are you talking to me? I did not stop to look at all the birds - we were there for an hour and a half and that was not really enough. You can tell that it's a new place - the gardens are neat and tidy, not getting jungly yet! And there are some bigger birds too. Several ostrich had a sizeable enclosure to themselves. I kept warning my kids to not lean over the barriers, as ostrich have long necks and big beaks! They are impressive birds. Time to go! A slightly rushed visit, enjoyed by all - especially my son the "bird man". Phuket keeps growing new attractions. I think this bird park and the botanic garden are worth a look for sure. And it's very likely that we'll go yet again!